The app, navigating notable sites in High Wycombe relating to the Great War, is being paid for through part of a £39,000 grant from the Higher Education Funding Council for England (HEFCE). The University is among 67 universities and colleges awarded a total of £2.8 million under the HEFCE Catalyst Fund. 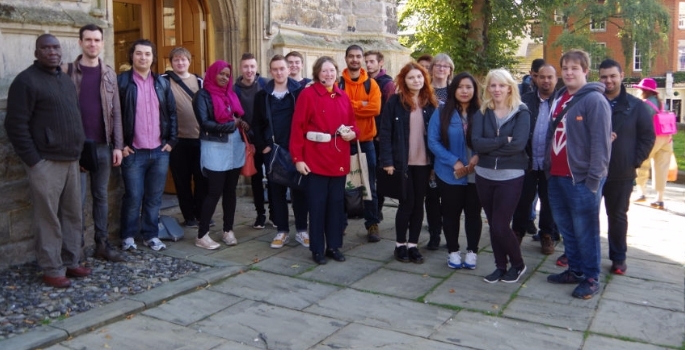 The ‘Heritage Trail App’ accompanies a trail being developed around the town by Wycombe District Council, with BSc (Hons) Computing students and BA (Hons) Creative Advertising students, led by Dr Richard Mather, Reader in Geomatics & Education, and Dr Helena Chance, Reader in the History and Theory of Design, working together on the project. The project team also comprises Bucks New University’s Rebecca Rochon, Senior Lecturer – Education; Richard Jones, Principal Lecturer in Computing & IT; Bruce Sinclair, Principal Lecturer and Course Leader of Creative Advertising; and Associate Lecturer Jon Jackson. HEFCE will work with the project so that the innovations and lessons learnt are shared with other providers across higher education. The trail, the app, information and activity packs and supporting exhibition material will be launched by the district council during summer 2017.